Although cycling is considered a low-impact sport, many cyclists will end up with knee pain at some point in their training. There are so many factors at play in regards to the bike itself, your body in motion, and how the two interact. It can be hard to isolate the cause of your knee pain, but understanding the location of the pain and potential causes can help you avoid future occurrences. You may experience pain along the back or outside of the knee when the seat is too high. When you are reaching too far for the pedals, the hamstring tendon and the iliotibial band are overstressed and may become sore. When the saddle is too low, you may experience pain around the kneecap due to the additional stress on the patellofemoral joint. You saddle should be adjusted to allow for 27 to 37 degrees of knee flexion to reduce overexertion. Riding with your saddle too far forward can cause pain in the front of the knee. Many riders feel that they can get more power by leaning forward, but it can actually cause unnecessary stress on the patellar tendon. Moving your saddle back can alleviate some of the pain in your knee. However, a saddle that is too far back can cause pain in the back of the knee due to overextension. If necessary, visit a bike fitting specialist to make sure your seat is properly adjusted. Even something as simple as foot placement on the pedals can impact your knee or cause pain. 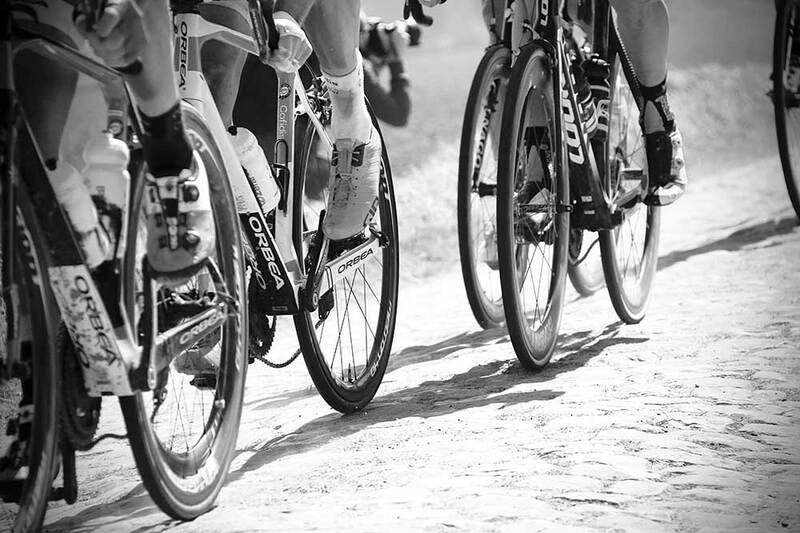 Most commonly, cyclists will experience pain on the inside of their knee. If your feet are too close together or too far apart, the knee is pushed inward or outward during pedaling, causing unnecessary stress on the joint. When positioning your cleats, align your knee with your feet so the force is directed vertically through your lower leg to avoid excess stress on the knees. Any of the knee pain described can also be evident of overtraining. Difficult courses or strenuous hill climbs can take a toll on your body, particularly if you normally cycle on flat ground. Increasing your mileage by more than 10% each week can harm your knees or lead to injuries in other parts of your body as well. Allow yourself recovery time after strenuous rides, and increase your mileage gradually to reduce the risk of injuries. Most of all, seek treatment when necessary and give yourself time to relax. In addition to treatment, it is recommended that you make appropriate adjustments to your bike and riding techniques in order to avoid future injuries. Dr. Heiden will create a customized treatment plan to alleviate your knee pain and help you get back on your bike as soon as possible. Great info, especially the need to find a professional, highly experienced bike fitter! The office is very accessible, the staff is warm and friendly. We have been seeing Eric Heiden for several years and highly recommend him for shoulders and knees. He and his staff are very approachable so talking to them you feel they really care.